O ur understanding of coral bleaching processes is hindered by the lack of robust methods for studying microscale interactions between the host and the symbiont. We cultured coral explants to investigate coral tissue with endosymbionts in vivo in real-time. We characterised the explants and found that they were morphologically and physiologically analogous to their parent coral, Fungia granulosa. I n a follow up study, we exposed coral explants to acute thermal stress and measured oxidative stress (reactive oxygen species) in individual symbiont cells and determined the intracellular concentrations of dimethylsulphoniopropionate (DMSP) and dimethylsulphoxide (DMSO). This work validated the applicability of using coral explants for investigating coral physiology and biochemistry, showcasing this new approach for studying host–symbiont interactions at the microscale. 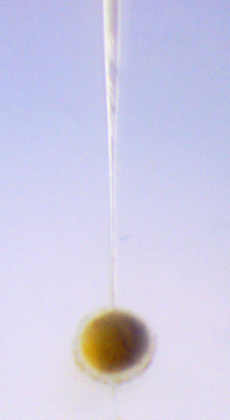 Microscopy image of an explant (diameter ~500 μm) being profiled using an oxygen microsensor.